Cutting and polishing are the only artificial processes that can be applied to a stone if it is to retain its classification as a natural diamond. 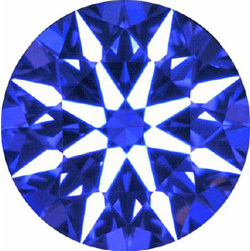 There are many cut patterns, but optical science states that the “round brilliant cut” provides the most brilliance. This cut’s even proportion and careful finish (its symmetry and polish) result in a truly brilliant stone. While a stone’s proportion can be expressed as a numerical figure, its symmetry is measured by a more subjective standard. 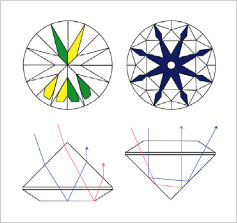 For this reason, it can be difficult even for diamond dealers to grasp the standard for symmetry. We have developed a method for gauging the light refracted from a cut diamond that can be easily understood by the average consumer. 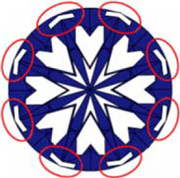 The Heart & Cupid™ method uses images to show what constitutes symmetry in a cut stone. 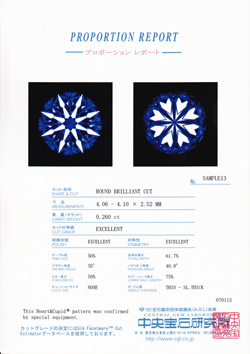 The illustrations above show the unique view of a brilliant cut diamond that can only be seen in specific lighting conditions. The name “Heart & Cupid” was inspired by the eight heart shapes visible on the pavilion side of the stone and the eight arrow shapes on the crown side. 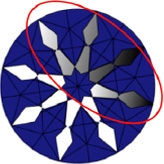 For these patterns to appear, the stone’s proportions must fall within a certain range of proportions, and its symmetry must clear a certain standard. If these conditions are met, the patterns can be observed, even if the cut has not attained an “excellent” grade. 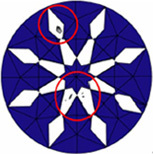 While this measurement depends on nothing more than a form of symmetry visible to the eye, rather than a more strictly scientific measurement, a consideration of optical science makes it clear that these patterns will only appear in diamonds with a considerable level of optical symmetry. 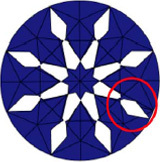 Why do these patterns appear when a stone is subjected to the Heart & Cupid method? Refer to the image at left. When light is projected through the main facets on the pavilion side, colored green and yellow here, it is reflected from the table face to illuminate the adjoining facets on the opposite side of the stone. The reflected beams from the green or yellow facets combine to form the heart-shaped patterns. Light projected into the stone from the table/crown side, meanwhile, bounces off of two inner faces to display the arrow-shaped pattern formed by the main pavilion-side facets. It should be clear that the reflected light patterns will not be pleasingly shaped unless the reflective facets themselves have been cut with a high degree of precision in terms of their angles, areas, and shapes. Even slight differences in cut and polish can greatly affect the patterns produced in this testing. The Heart & Cupid grading is based on the standards described below. 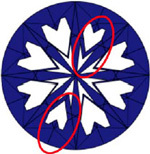 Heart shape is acceptable if a notch at a bottom of the cleft is narrow and no more than 1/3 of the total height of the heart (left); if a notch in the cleft is too wide, it is unacceptable even if less than 1/3 of the heart’s height (center); even a narrow notch in the cleft is unacceptable if it extends more than 1/3 of the heart’s height (right). The pattern does not look like hearts due to the table face being too small (unacceptable). 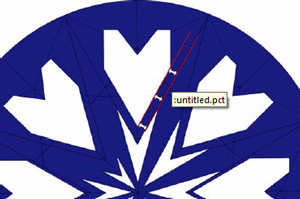 If the table face is too broad, the heart shapes will be too angular (unacceptable). This heart tip shows only a slight shift to one side (acceptable). Just one heart is smaller than the others, but this is within allowable limits (acceptable). .Although it is acceptable even if less than 1/3 of the heart’s height. Hearts show considerable differences in size (unacceptable). 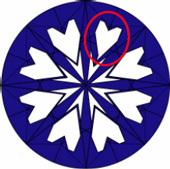 Samples with unclear borders between the hearts and V-mark patterns are unacceptable, but if borders are clear, they may be acceptable even if they are of slightly different lengths on either side of a heart. 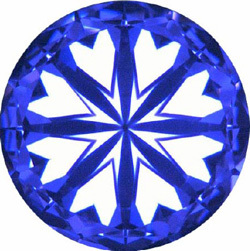 In some cases a butterfly-shaped reflected pattern is visible around the edge of the gem. As this does not impact the shape of the hearts, it has no effect on the grading (acceptable). Borders are narrow, but discernible (acceptable). Inclusions in the stone can affect the reflected patterns, but if the heart shapes are not considerably impacted they are acceptable. Inclusions have no serious effect on heart shapes (acceptable). Inclusions with considerable impact on heart shapes (unacceptable). 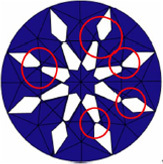 The arrow shapes must at a minimum be clearly discernible, and the directions and shapes of the eight arrows must be symmetrical. 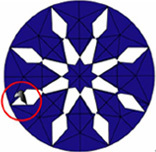 The images below make the difference between symmetrical and nonsymmetrical arrows clear, with the gem at left being acceptable and the gem at right unacceptable. Arrow with inclusion flaw (within limits of what is acceptable). Inclusions do not harm arrow pattern (acceptable). Inclusions with serious impact on pattern (unacceptable). Brightness variation in the arrows: light does not reflect with white color (unacceptable). Arrow shaft does not align with head (unacceptable). Arrow shafts and heads are unaligned (unacceptable). * “Heart & Cupid” is a registered trademark of the CGL, in Japan. * Applied for trademark in China, Hong Kong and Taiwan. * All standards in this report are based on fixed-camera images taken by the CGL. 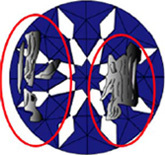 Visual data displayed with simple imaging equipment may lead to different results from those obtained with fixed equipment due to the tendency of a moving eye to focus on the best-looking heart- and arrow-shaped patterns. * English translation by Mark Hiroshi Willis (GIA G.G. ).